If you too facing "Adobe Media Encoder Fail" situation, then you are on the right page to solve the Adobe Media Encoder has stopped working. Some of your Adobe Media Encoder failed unknown error & may get "This application was unable to start correctly (0x00007b)" error or Adobe Media Encoder keeps crashing, fails export premiere, every time when you try to add your project to encoder queue. It is not related to either your operating system nor your PC hardware. Then the question is; how to solve; Adobe Media Encoder always fails 1st time, Why does Adobe Media Encoder fail to export? Why Adobe Media Encoder Fails to Launch and doesn't work? So stop searching about Adobe Media Encoder not working, Adobe Media Encoder crashes when rendering, adobe cc media encoder crashes on startup or quit unexpectedly and just follow these steps to get Adobe product AME back to work. A quick solution to the crashing issue of splash screen when Adobe Media Encoder CC doesn't work/start/load. Learn to fix adobe media encoder problem using easy steps. Last time we have seen how to fix Microsoft SQL Server Failed to Install or Reinstall and it was also something irritating. 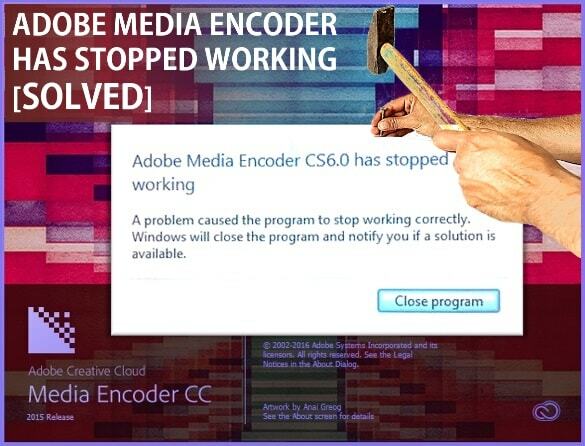 Similar to that, today we are going to see Adobe media encoder tutorial to get rid of AME not working errors. Even Adobe media manager also failed to solve this. After troubleshooting, it is seen that this error is all about the corrupted preferences files. And it needs to reset those file. There are many solutions, I have described below, and I am sure one this will work for your system and make your Adobe encoder working and start to render with Adobe media converter again. I was troubleshooting on AME doesn't start or launch and why does this Adobe Media Encoder keep crashing, this process consists following relevant solutions. Some solutions are odd, but it may work some of you Adobe users. So check one by one. Go to where the Adobe Media Encoder executable files are installed [C:\Program Files\Adobe\Adobe Media Encoder CC 20xx]. Now hold Ctrl+Shift+Alt and run the program. This will remove and reset the corrupted cc media preferences files & all the settings and bring AME back to work. Delete all of the lines & save it. Now set the file to 'Read-only'. Move the content of these directories elsewhere and try to run AME again. Go to 'Device manager' >> Deactivate graphic drivers. If this works for you, then you need to remove, update and reinstall your graphic drivers. STEP 5. Install new AME updates. This is one of the best and works for most of the users. I recommend this as it worked for 80 people out of 100. This site has all Adobe updates. You need to download all the updates [specially Adobe Media Encoder Updates] related to Adobe products you have installed in your system. Fix "Thank you for using Adobe media encoder the grace period has expired.... "
Most of the users are stuck on to fix the "The Adobe product that installed Media Encoder has not activated". To solve this adobe media encoder problem you just need to copy & replace the amtlib.dll library file from Adobe Premiere installation folder to Adobe Media Encoder folder. Hope this will help you out there. And let me know which solution helped you to run Adobe Media Encoder quickly back to live to render your projects again.